This is a very simple, traditional model. The flower can be cut into a variety of shapes. 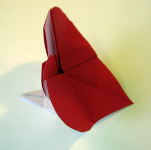 We've designed two heart-shaped variations. 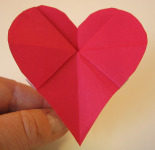 Tip: If you will be making a heart variation, you might want to practice cutting a heart out of a piece of scrap paper folded in half. You’ll want to have your technique down before you cut into your model. The prettiest hearts are plump and curvaceous. 1. Important: Start with the colored side up. The flower is going to be whatever color is up when you start. 2. 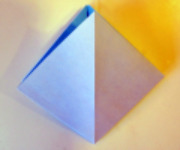 Fold a square base (also known as a preliminary base). 4. 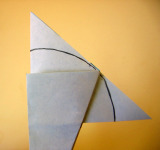 Working with the top layer, fold in the lower sides to meet the center crease. 5. Turn the model over and repeat Step 4. 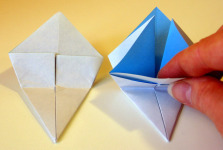 You have a kite shape. 6. 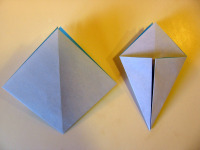 Fold model in half, bottom to top, to make a crease. Tip: Since it’s really thick at this step, creasing with the back of a spoon might be helpful. 7. 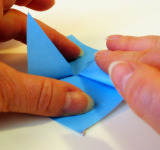 Open the flower by folding the top layer toward you along the crease you just made. 8. Notice how the flower has four sections or petals. 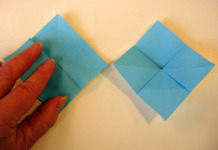 Squash-fold the two side petals into perfect little squares. 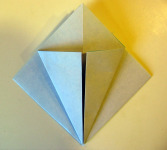 Together, the four sections form a square flower. 9. Using the instructions below, cut the shape you want. 10. 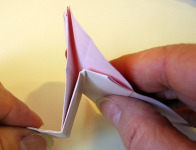 To make the model stand on its own, fold the tip of the stem up, and increase the angle between the flower and the stem. 1. 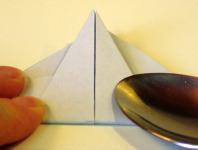 Fold the lower half of the flower up, forming a triangle. 2. Fold the model in half. 3. Cut a quarter circle. 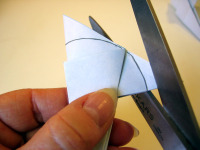 Tip: It’s easy to cut more, but impossible to put part of it back if you cut too much. 4. Open the flower and make any touch-ups you want. 1. Fold the model in half the long way. Here’s where your heart-cutting practice pays off. 2. Cut a half-heart. It’s okay to cut through any part of the model, except the stem (the part below the thumb in this photo). Tip: To avoid cutting the stem, it might be necessary to pull the bottom tip of the heart away from the stem a little bit. 3. Open the heart and check your progress. 4. 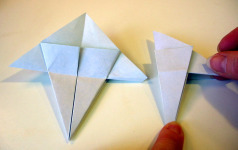 Do any re-folding and/or re-cutting until you have the shape you like. 5. Looking at the heart, notice how you can see bits of the back, like above the index finger in this photo. If this doesn't bother you, you're done. Good job! 6. (Optional) Working on the back side, trim these bits until you like the result. As long as you don’t cut into the “face” of the flower or the stem, you can cut away quite a bit without harm to the model. This is our logo at the top of the window. It’s a tricky cut that might require some practice. 1. 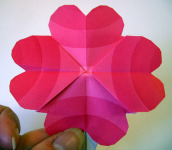 Fold the lower half of the flower up. 3. Cut two mini hearts. But notice you only cut the upper part of the lobes. 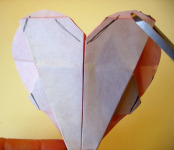 The lower parts of the hearts are formed by the folds.